Buffalo Bill's Rough Riders From All Parts of the World Will Be Here Soon. With the addition of many new features, international and patriotic in character, an in entire consonance with the nature and purposes of his world famed exhibition, Col. W F Cody will give the residents of this city a chance to see the Wild West and Congress of the Rough Riders of the world. The main features which have gone to make up the Wild West in past seasons have been retained, but in addition there is much that is entirely new. 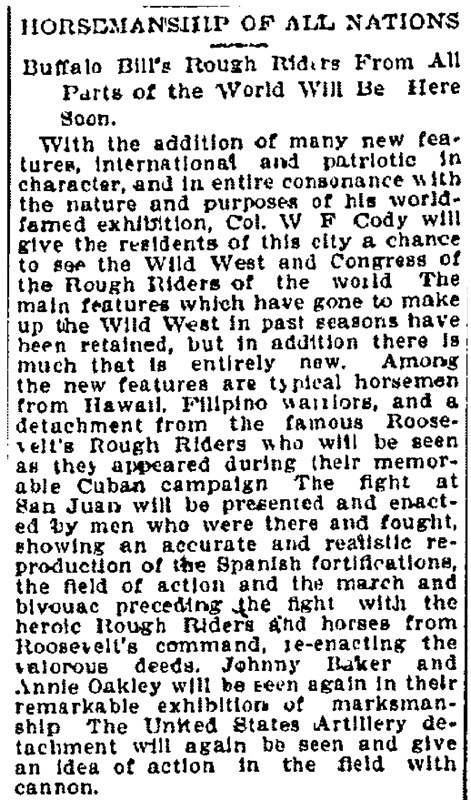 Among the new features are typical horsemen from Hawaii, Filipino warriors, and a detachment from the famous Roosevelt's Rough Riders who will be seen as they appeared during their memorable Cuban campaign. The fight at San Juan will be presented and enacted by men who were there and fought, showing an accurate and realistic reproduction of the Spanish fortifications, the field of action and the march and bivouac preceding the fight with the heroic Rough Riders and horses from Roosevelt's command, re-enacting the valorous deeds. Johnny Baker and Annie Oakley will be seen again in their remarkable exhibitions of marksmanship. The United States Artillery detachment will again be seen and give an idea of action in the field with cannon.